About: Solu is a new diet sweetener that guarantees to drop 5% of a person’s body weight in days. Could this be the answer to the world’s obesity problem? To find out, a celebrity “Cruise to Lose” is put together that is only available to the rich and famous. Laurel, a curvy and self assured teen accepts her friend Viv’s invitation on the cruise. Due to seasickness, and lack of interest, Laurel passes on the sweetener. Then, Viv and all the other passengers start acting really strange…. Solu, a sweetener that is said to reduce a person’s body weight (fast), and is promoted on a cruise a week before it hits the markets. At first, the main character, Laurel, is too sick to even TRY it. And when she finally does come around, everyone who took Solu becomes ADDICTED to it. Everyone literally becomes a walking vampire. Imagine being on a cruise with 500 other people. 100 of them are like you: they’re normal. But the other 400? They trample and rip each other apart, limb for limb, because they smell like the Solu they’ve been eating. Everywhere is chaotic, and all you’re trying to do is get away from those monsters. I know, you’re probably thinking, “That sounds gross! It must be a TERRIBLE book!” But in fact, it’s the exact opposite. It was AMAZING. I loved how realistic the characters were… all of them. I cringe when I read a book with “perfect characters.” I love the main characters Laurel because of how “imperfect” she is, and how she doesn’t even care. She doesn’t care that she’s not skinny, or that she’s not girly, and I love that about her. Her POV was really interesting to read. Tom because of how realistic he is. I enjoyed reading from his viewpoint because it gave insight on how being a celebrity isn’t all fun and games. And even though he’s famous, he wasn’t perfect. The plot itself was very interesting and enjoyable to read, and the plot twists kept me on my toes. It discussed an interesting concept, and portrayed it in a unique way.The beginning was a little slow, light and airy, but as soon as you got into the book, you could feel the darkness and eeriness in the atmosphere. The only part that really ticked me off was the ending. That. Cliffhanger. Totally give this book an 11/10. If it doesn’t make the Lone Star list, I’m probably going to rethink my whole life. If you don’t think I went into enough detail with this review, feel free to ask a question! Hanna S’s Thoughts (Murphy MS student): Sweet is a novel that takes place on a cruise. A new sweeter has been discovered that can reduce your weight as much as 5%! The rich and famous take their place on board, to get early access to this remedy for obesity. Laurel just happens to be an average teen who gets a free pass on the cruise due to her rich best friend, Vivian, and Laurel does not trust this new “Solu”. Neither does Tom Forelli, a nineteen year old star know for a show he did way back when he was given the nickname “Baby Tom-Tom” that stuck. He’s here to broadcast and interview the cruise, and just like Laurel, does not take any Solu. As Tom and Laurel catch each other’s eyes, the whole ship turns into a zombie apocalypse on the ocean. Emmy Laybourne does an extremely good job of making this book hard to put down. After all, I read it in a day. As good as the plot is, the book can get risque. There are curse words, making out, dead people and violence. So, as much as the title is Sweet, the content may not be sweet for some readers. Otherwise, I would recommend this book for those who love survival situations, romance, and realistic fiction ( it’s pretty realistic if I do say so myself ). For all of this, I would give the book a simple 10/10. 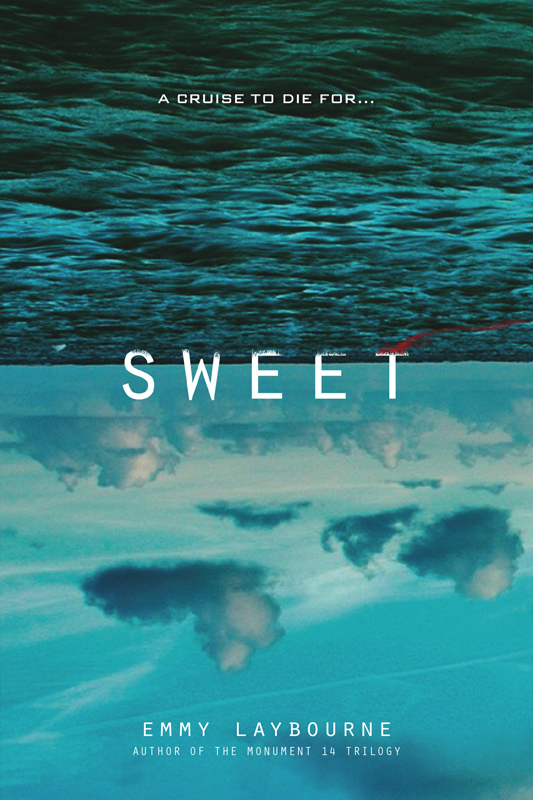 Audrey’s Thoughts (SPL Teen Librarian): Sweet is a multi-faceted, thoroughly enjoyable read that drastically amps up intensity and creepy/horrifying factor at an enjoyable pace. Many parodies to relevant pop culture events and individuals litter the pages, as well as commentary on self image, identity, and the idea of “reality tv/TZM” being more of a product than realistic portrayal. I loved Laurel and Tom’s depiction of real people that are not caught up in the beauty/celebrity myth and stand up for what they believe in. This entry was posted in action packed, Horror, Murphy Middle School, Texas Lone Star List 2016, Thriller, young adult and tagged action packed, horror, Murphy Middle School, romance, Texas Lone Star List. Bookmark the permalink.